The following information was excerpted from the Code of Virginia , Title 1, Chapter 5, Section 1-510. Virginia symbols were re-organized under one section of the Code of Virginia in 2005. Flower - American Dogwood ( Cornus florida). Brook Trout: Trout Unlimited Conserving, protecting and restoring North America's coldwater fisheries and their watersheds. Salvelinus fontinalis (brook trout): University of Michgan Musuem of Zoology: Animal Diversity Web. Salvelinus fontinalis: CalPhoto photographs. The Biodiversity Sciences Technology group (BSCIT), a part of the Berkeley Natural History Museums at the University of California, Berkeley. Salvelinus fontinalis (Mitchill, 1814): Froese, R. and D. Pauly. Editors. 2009.FishBase. World Wide Web electronic publication. www.fishbase.org, version (01/2009). Salvelinus fontinalis (Mitchill, 1814): Integrated Taxonomic Information System! Here you will find authoritative taxonomic information on plants, animals, fungi, and microbes of North America and the world. State Fish: Complete list of official state fish. More symbols & emblems: Complete list of official Virginia state symbols. Freshwater Fishing in Virginia: Virginia Department of Game and Inland Fisheries. Brook Trout , by Nick Karas. 388 pages. The Lyons Press; 1st edition (November 2002) The much maligned brook trout gets star billing in this encyclopedic, readable study of Salvelinus fontinalis from Newsday outdoor columnist Karas. 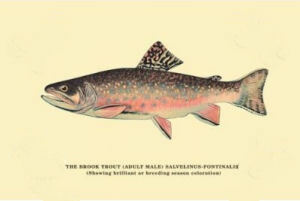 The Brook Trout and the Determined Angler , By Charles Barker Bradford. 88 pages. Read Country Books (June 1, 2005) First published in the U.S.A. in 1900. The author was a well known fisherman and a prolific sporting writer who contributed many articles to the American field sports press of that era. This book is a collection of some of the best of these. Illustrated by full page black and white illustrations and photos and a number of small pen and ink sketches. Canvas Print, The Brook Trout , by George Sheringham. (Showing Brilliant or Breeding Season Coloration) - 30" x 20" Canvas Print stretched over wood frame. 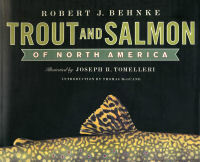 Trout and Salmon of North America , by Robert J. Behnke. 384 pages. Free Press (September 24, 2002) Behnke, professor emeritus of fishery and wildlife biology at Colorado State University, has brought his more than 50 years of studying, and fishing for salmon and trout, to wonderful effect. He provides readers with an authoritative compendium of the evolution, biology, ecology, habitats and behaviors of these prized game fish. A capsule legend that includes scientific name, other common names, habitat, size, life span and diet accompanies each entry, amazingly illustrated by Tomelleri, whose fish seem to shimmer on the pages. Habitat maps, which include coastal waters, rivers, streams and lakes, are detailed and specific enough to be taken on fishing excursions. The book includes a good deal of fishing lore, as in the notations that describe the best flies, bait and lures for specific types of fish and locales. About Trout: The Best of Robert Behnke from Trout Magazine , by Robert J. Behnke. 272 pages. The Lyons Press (September 1, 2007) Behnke brings scientific expertise, a sense of humor and a flair for drama to this collection of 43 essays previously published as his About Trout column in conservation organization Trout Unlimited's Trout magazine. Behnke considers the evolution, historic and current distribution, biological characteristics and defining physical traits of various species of trout and salmon-from the common brown trout and well-known Atlantic salmon to the rare Apache trout and the once-presumed extinct, now-endangered Alvord cutthroat trout. Trout , by Ray Bergman. 576 pages. The Derrydale Press (October 25, 2000) Trout is arguably the finest single volume ever produced on how, why, and where to catch trout. In spite of being originally published in 1938 (Penn Publishing Company), it remains utterly relevant. Trout Rigs & Methods , by Dave Hughes. 322 pages. 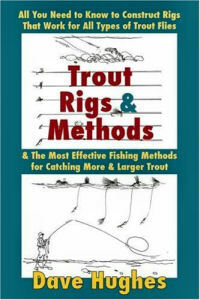 Stackpole Books (January 10, 2007) Clear and simple instruction and explanation describes 18 trout rigs and 81 methods to fish them. In moving water: rigs and methods for dry flies and emergers, nymphs, wet flies, streamers, and dry flies and droppers. In stillwater: dry flies and sunk flies.Fly fishers learn the specifics of the rig--types of fly line, lengths and tapers of leader and tippet, the flies, and split shot, putty weight, strike indicators, droppers, point flies, and indicators--and the full array of methods to present the rig to the trout. Essential Trout Flies , by Dave Hughes. 92 pages. Stackpole Books (April 2000) A core list of flies that will catch trout anywhere, in every season, this collection includes the most important patterns in a wide range of styles, from dry flies to streamers. The tying steps for each pattern are illustrated in step-by-step photos with detailed captions, followed by photos and recipes for the six most useful variations-217 patterns in all. Each chapter features a description of the insect the pattern imitates as well as expert information on how and when to fish the fly. 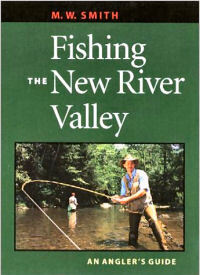 Fishing the New River Valley: An Angler's Guide , by M. W. Smith. 94 pages. University of Virginia Press (March 2002) M.W. Smith launches readers on an informative journey to the best fishing spots in and around the New River Valley. Covering a wide range of prime fishing territory across western Virginia, Smith's guidebook explores techniques designed to increase the day's catch and locations certain to enhance an angler's enjoyment of the region's natural beauty. Fishing the Roanoke Valley: An Angler's Guide , by M. W. Smith. 112 pages. University of Virginia Press (September 2003) With easy access to the Roanoke and James Rivers, Carvins Cove Reservoir and Smith Mountain Lake, and the many other streams and lakes in Bedford, Botetourt, Franklin, Henry, Patrick, Pittsylvania, Roanoke, and Rockbridge Counties, anglers in the Roanoke Valley are blessed with some of the finest lake and river fishing on the East Coast. Fishing The Greenbrier Valley: An Angler's Guide , by M. W. Smith. 82 pages. University of Virginia Press (August 17, 2005) While sparsely populated, the Greenbrier Valley is home to some of the richest outdoor recreation resources in the mid-Atlantic. Though the Greenbrier Valley is well known for its excellent smallmouth bass and trout fishing, many anglers don't realize that white bass, catfish, and walleye also can be found there. Fishing Virginia's Highlands: An Angler's Guide , by M. W. Smith. 96 pages. University of Virginia Press (August 21, 2007) Rich in angling lore, the secluded lakes and rivers of Virginia's Highlands offer some of the best trout and smallmouth bass fishing found anywhere in the state. Fly Fishing Virginia: A No Nonsense Guide to Top Waters , by Beau Beasley. 159 pages. No Nonsense Fly Fishing Guidebooks (May 1, 2007) From small creeks to the expansive Jackson River, Beau Beasley shows you where to fly fish in Virginia. Detailed maps, photographs, and Beasley's wisdom guide you through the many waters in the Old Dominion. Use this book to plan your next trip and then take it along with you. 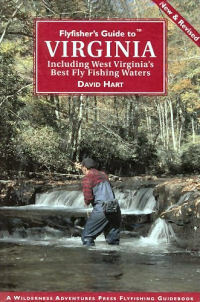 Flyfisher's Guide to Virginia , by David Hart. 529 pages. Wilderness Adventures Press; 2nd edition (September 30, 2006) The Flyfisher's Guide to Virginia is the most comprehensive book ever written on flyfishing in Virginia and West Virginia. David describes in detail each water with tips on how to fish the waters, recommended flies, hatch charts, and stream facts. He also covers some of the little known but great flyfishing gems in each state. Trout Streams of Virginia: An Angler's Guide to the Blue Ridge Watershed , by Harry Slone. 192 pages. Countryman; 4 edition (September 18, 2006) Guide to Virginia's beloved Blue Ridge watershed offers fly-anglers all they need to know. Slone includes complete information on access, stream conditions, and regulations. His tips on specific flies and tactics for specific waters will help everyone from the novice to the inveterate, seasoned angler. Virginia Blue-Ribbon Streams: A Fly-Fishing Guide , by Harry Murray. Frank Amato Publications (May 2000) The cool, clear waters of Virginia have much to offer the angler. Stream by stream, Harry Murray details their geography; the fish they hold; where and how to fish them; extensive resources; productive flies and presentations; and more. A Fly Fisherman's Blue Ridge , by Christopher Camuto. 196 pages. University of Georgia Press (May 11, 2001) The free-running love of wild trout and trout rivers in these 11 linked articles nearly overflows the cycle-of-the-fisherman's-year structure meant to contain it. The essays draw in the tributaries of the area's rich folklore, complex geology and colonial history--including the evidence of pollution and stress on the watershed--and emerge as a strong voice for real wilderness: "If the mountains can be said to have a consciousness, it is to be found in these trout." Virginia Game & Fish , [ Magazine Subscription ] Your local guide to Virginia's hottest places to fish and hunt. Trout & Salmon , [ Magazine Subscription ] Features, news on all aspects of game fishing. Complete line of fishing equipment including rods, reels, rod and reel combinations, fly fishing gear, bait and spin casting rods and reels, ice fishing equipment, lures and flies, and other accessories. All major brands.